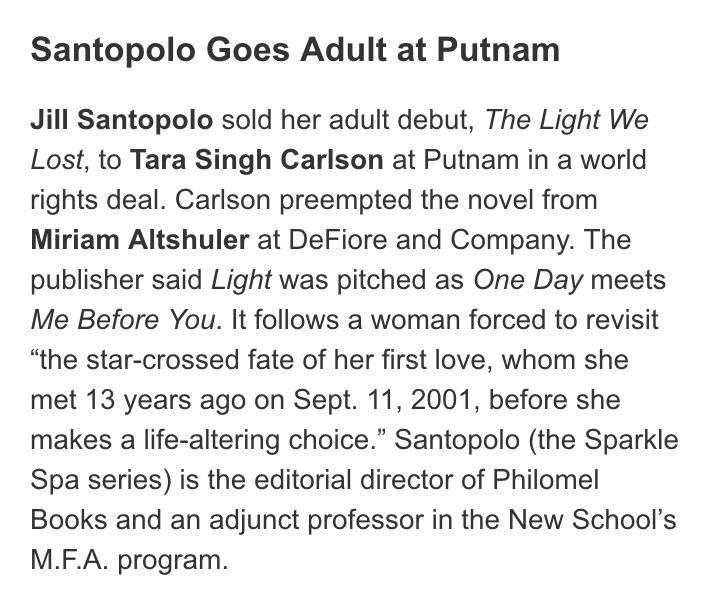 The editorial director of Philomel Books, Santopolo has three children’s/YA series to her name, but here she’s going adult. Lucy and Gabe meet one fateful day as seniors at Columbia University, then meet again a year later and decide it’s meant to be. But photojournalist Gabe is assigned to the Middle East, while Lucy pursues a career in New York, and more than a decade of love, jealousy, and turmoil follow until a key decision must be made. Rights for this novel sold quickly to 25 countries, and the prepublication buzz has been big. You can read the whole list of Pop Fiction Preview books here, if you’d like (warning: it’s dangerous–reading the descriptions made me want to buy all of them). The Light We Lost foreign publishers! I’m so, so touched and so, so grateful that writers who read early copies of The Light We Lost liked it enough to provide blurbs for the jacket and the book’s interior. I’ve read books (and/or articles) by all of the people below and am a big fan of all of their writing (so many great books to buy!). Thank you, everyone, for your incredibly kind words and support. Christmas (and Chanukah) came early this year at my house. The wonderful team at Putnam sent me the jacket for The Light We Lost and I just adore it. (I also adore the quote from Delia Ephron right under my name–and if you haven’t read her book Siracusa, it’s a perfect holiday gift to buy for yourself or a loved one.) Here’s the jacket! 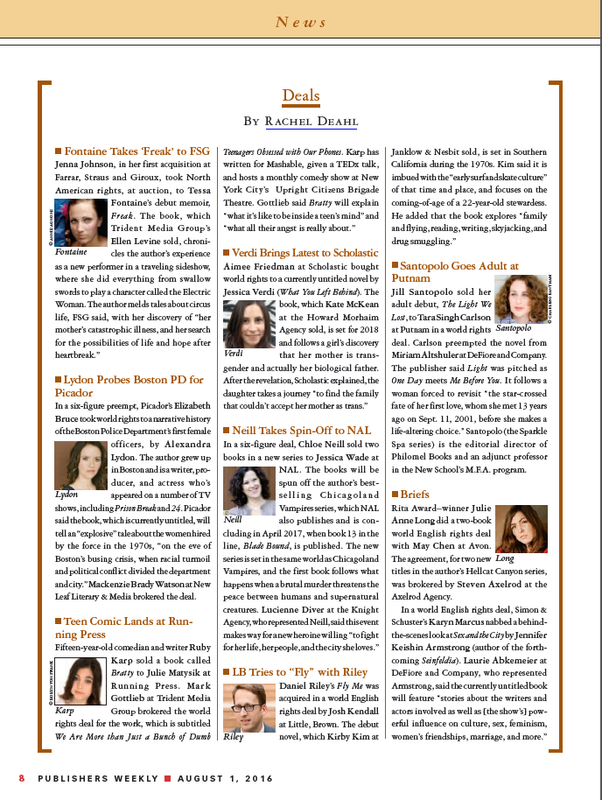 And if you’re looking for some more information on the book, you can find it right here. Here’s the article, if you’d like to click for more info. 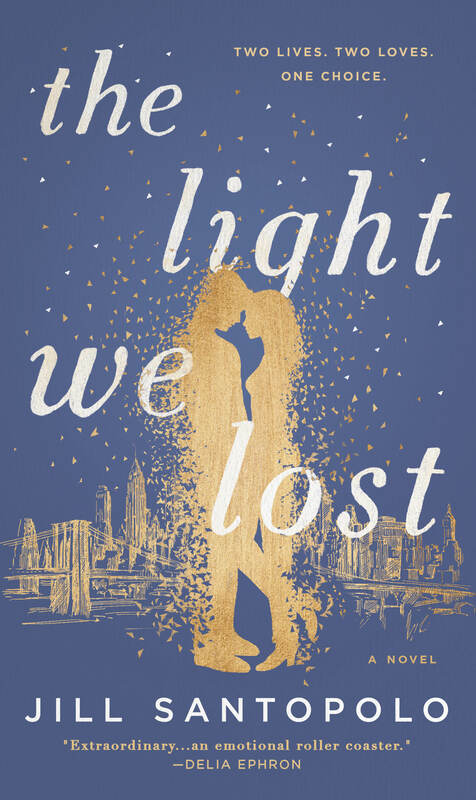 So thrilled to be announce that The Light We Lost will also be published in Germany, Denmark, China, and the U.K.! This is a screen grab of the announcement in Publisher’s Marketplace. My Debut Novel for Adults!